Between all the food photography craziness and the recent feature of my last post on foodgawker (!!!!!!!!) and TasteSpotting (!!!! 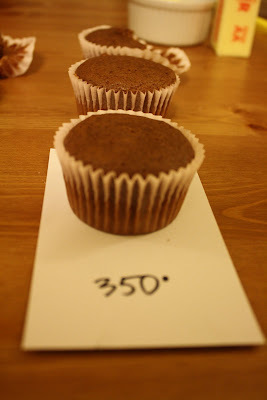 ), I nearly forgot to tell you -- I cracked the recipe for Hummingbird Bakery chocolate cupcakes. My earlier theory -- that the chocolate (from the cocoa powder in the batter) needed to be set in order to prevent the cratering that was occurring during the cooling process -- turned out to be right. 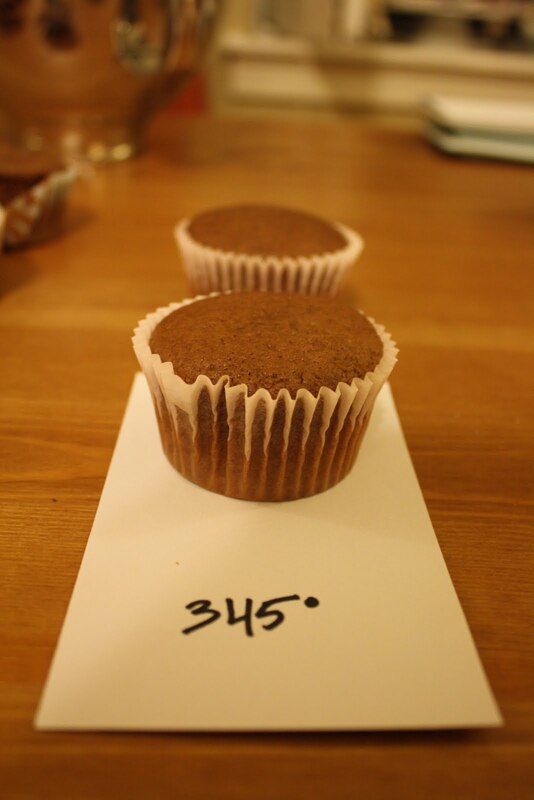 Instead of leaving the chocolate cupcake to cool on its own devices, I cranked the temperature up from the recommended 325 (F) to allow the extra heat from the temperature increase to "set" the structure of the cupcake. But it's conventional wisdom that chocolate burns really easily. 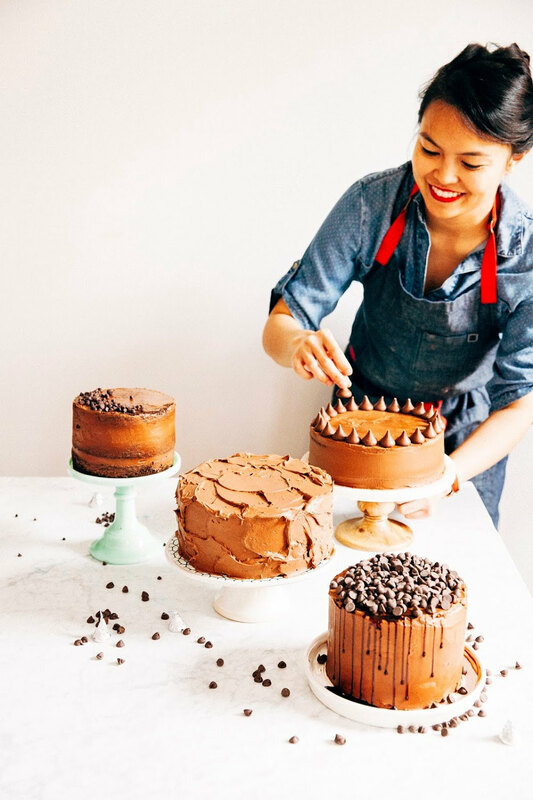 According to Paula Figoni of How Baking Works, chocolate must be melted carefully as they contain a mix of proteins and carbohydrates that are easily overheated. This is why chocolate must be melted using a double-boiler -- even low, direct heat from a stove top is enough to turn the chocolate into a burned, thick, lumpy mess. Definitely still undercooked. Look at the bottom part of the toothpick! It looks almost liquidy. Wa-hey! Some more improvement here. Instead of the vaguely cratered, ever-so-slightly sunken-in cupcake tops, I had FLAT tops. The cupcakes still had a little bit of batter stick to the toothpick at the 20-minute test, but they definitely passed the Hummingbird tops-that-bounce-back test! So how did these taste? Hm. Not perfect. A little too soft and moist. Hummingbird Bakery cupcakes have a substantial fluffy, non-sticky crumb, but these were missing it. Why hello. Perfectly domed cupcake tops that spring back when touched! 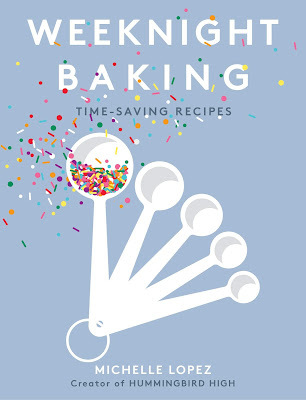 Exactly what the Hummingbird Bakery Cookbook described. But what about the taste? For the vanilla cupcakes, I ended up using an additional tablespoon of milk because my temperature adjustment dried them out. However, I adjusted the vanilla cupcakes by a full 50 (F) degrees; these chocolate cupcakes only received an adjustment of 25 (F) degrees. I'll take the deeper brown as a sign of chocolate cupcakes cooked to perfection. I remember that the vanilla cupcakes, when cooked at previous temperatures, were pale and had a bit of an undercooked look about them. I didn't realize that chocolate also had an undercooked color! Score, ladies and gentlemen. Score. I will publish the fully-adapted, high-altitude friendly recipe in these next few posts.